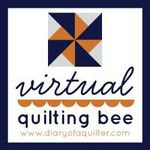 my fabric relish: virtual quilting bee blocks...ALL 16! Yay! 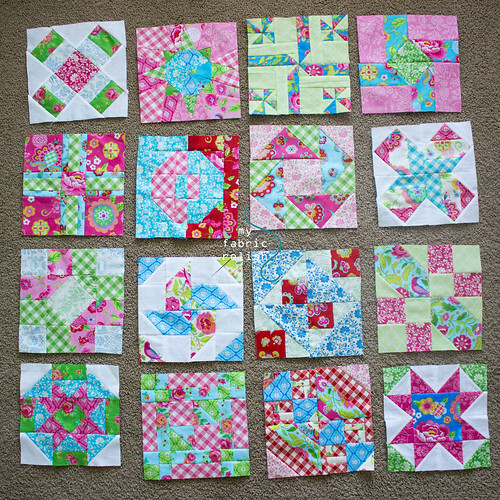 My Virtual Quilting Bee blocks are finished and I got some pictures of them today. I had an unexpected day at home because little relish is sick. Here are all the blocks together! I think I am going to set them using my other layer cake in this fabric and make it scrappy-ish. If you want to see all the blocks, check out my headquarters post. gasp! These are so beautiful!! I love the happy fabrics! thanks Margaret! I just finished setting them this weekend and pretty excited to see the finished quilt! 8 months is a long time for me to work on one quilt....haha! Thanks for visiting and leaving a comment!